Eliminate moral hazard from the financial system by implementing this measure to make bank directors strictly liable without limit and to treat as capital both directors’ personal bonds and, for five years, the bonus pool. Introduce prudent bank accounting so banks can’t game the rules using derivatives to manufacture illusory profits from unrealised cash flows. It’s not capitalism when private individuals stand to gain from their actions but the taxpayer carries the risk. When risks are socialised and potential profits huge, individuals are bound to be reckless: why be responsible? It’s no good agonising about the culture of banking without considering the astronomical moral hazard endemic in the system today. Of course people who do not have to bear the negative consequences of their actions behave badly. Profits are privatised and risks socialised, creating incentives to be reckless. The entire interest rate market is deliberately manipulated by the central banks to promote or restrain lending and saving. Government has a monopoly on money and legal tender laws enforce it. Fiat money – paper promises to pay and accounting entries corresponding to new loans – means that there is no effective restraint on the creation of new money by banks. The banks own the money in your current account: they fund themselves from money which they owe you immediately on demand. To deal with the problems created by banks funding themselves out of your current account, there’s taxpayer-funded deposit insurance and a lender of last resort. As the Bank of England admits, that means public subsidies which could be worth over £100 billion to UK banks plus an overblown financial system which draws resources from other sectors. The system has been tightly but badly regulated for years. Anyone who thinks banking has been laissez-faire hasn’t worked in a bank or a regulator, tried to start a new bank or looked at the regulations. The result is a centrally-planned, taxpayer-backed banking system in which money is loaned into existence by institutions which are systematically encouraged to be reckless by bad regulation. That’s why there was a tripling of the money supply between 1997 and 2010 in a vast credit boom which was bound to burst. That’s why individuals were prepared to manipulate market prices for unjust personal gain. As if this were not bad enough, banks create illusory profits and capital by using derivatives to game accounting rules under the International Financial Reporting Standards (IFRS). Gordon Kerr explains how in detail here. And without prudent accounts to provide a true and fair view of banks’ financial positions, how are even basic laws to be applied? 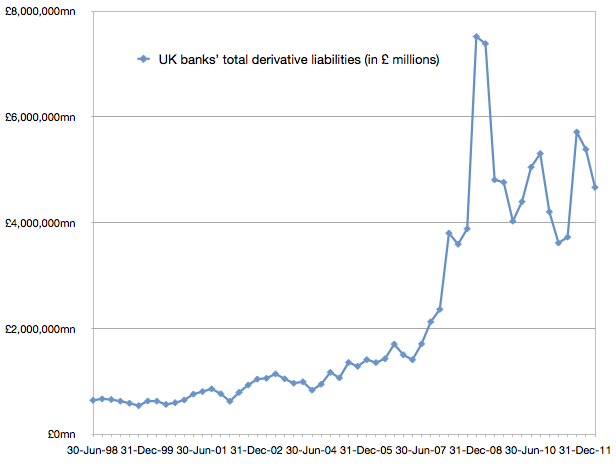 It’s time to privatise commercial risk in banking and insist on prudent accounts. Risks cannot and should not be eliminated. Society needs a successful, entrepreneurial financial system to provide productive investment. But officials must stop pretending that the consequences of moral hazard can be regulated away. In a free society, people must take responsibility or there will be licence, lawlessness and chaos – just what we are seeing today. My Financial Institutions (Reform) Bill and my Financial Services (Regulation of Derivatives) Bill would transform the culture of banking, enable a true and fair view and stop exploitation of shareholders and taxpayers by reckless individuals in the system. There would be no need to claw back bonuses: they would already be treated as capital and taking losses. Commercial error would receive financial penalties: there would be no calls for criminal law to deal with the consequences of bad business. And, told well in advance that they would be taking unlimited personal liability for their banks’ losses, you can be sure that bank directors would soon split up our banking behemoths into the smaller, more manageable and competitive institutions that we need – without legislative intervention. There may be little point in a further independent inquiry. The Vickers Independent Commission on Banking already reported and the Government is legislating but the proposed measures don’t deal with moral hazard or bad accounting. The rewards for risk-taking will still be huge and the risks will still be socialised: does anyone really believe that will lead to lasting cultural change? The country needs a new direction and new answers. I am clear about the new direction we must set for Britain. To meet the challenges of the twenty-first century, and to satisfy people’s aspirations today, this country needs a responsibility revolution. Both King and Cameron were right: we have the worst possible banking system and this country needs a responsibility revolution. The LIBOR scandal shows it is time to take serious action. Government and officials should stop pretending they can regulate away the consequences of giving bankers freedom without responsibility. They can’t. They should adopt my bills. To say “The banking system isn’t capitalist” (headline) is quite right. Though the old style of capitalist who lived in the big house on the hill and owned the mills and houses in the swampy valley where his employees lived and worked is a thing of the past. Now it is very difficult to identify who owns the call centres and distribution centres and data centres and financial centres of modern commerce. What we have is corporatism and the corporations (and especially the finance corportions) through their networks of shell companies, all own each other. Making bank directors responsible for losses is a start but much more is needed if we are to get back to sanity. What a great article. This encapsulates the banking problem and provides the framework for the correct solution. It should be freely circulated around the commons so that MPs understand what they are dealing with. I have one rather large reservation, The City has the power to block any change where these proposals are attempted to be implemented. And they will.